Bill Payne has devoted his entire law career to litigating employment-related disputes in state and federal court and counseling clients on workplace matters. With a background as a local newspaper reporter and high school English teacher, Payne’s employment law practice has benefited from an emphasis on in-depth investigations, interviewing and counseling, and effective written and oral presentations. 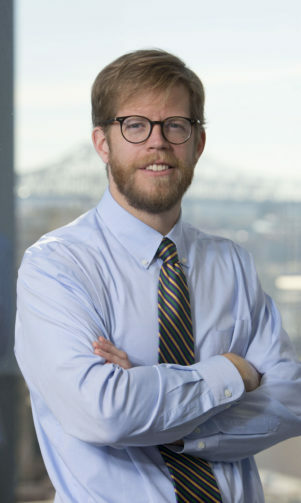 Payne has argued in the Sixth Circuit, successfully first-chaired a jury trial, and handled cases under all the major federal employment statutes, including class and collective actions. Payne has had unique experience with FLSA misclassification cases and complex cases arising under ERISA and enjoys helping employers understand these rapidly evolving areas of law. In addition, Payne served as a law clerk for the Hon. Shelley J. Rucker in the U.S. Bankruptcy Court for the Eastern District of Tennessee. Familiarity with the bankruptcy code enables Payne to handle employment litigation issues that arise in the midst of bankruptcy proceedings and counsel clients on possible bankruptcy court outcomes. Payne enjoys listening to music of all varieties, going on adventures with his family, long distance running, and throwing the tennis ball for his dog.